While I love to sew, I also like to throw in a project that doesn't require sewing because it reaches a lot of people who might not have a sewing machine. These little headbands literally took 2 minutes to make and I used old t-shirts to make them. You can make them for any age person. Now, I don't like to give an exact length of the headband because not only are head sizes different, but every knit fabric stretches differently as well. Some are super stretchy and others are more tight. This measurement was for a small baby. You need one rectangle big enough to go around the head and another to wrap your seam. ...and it'll look like this. It's a thin layer of sticky adhesive. 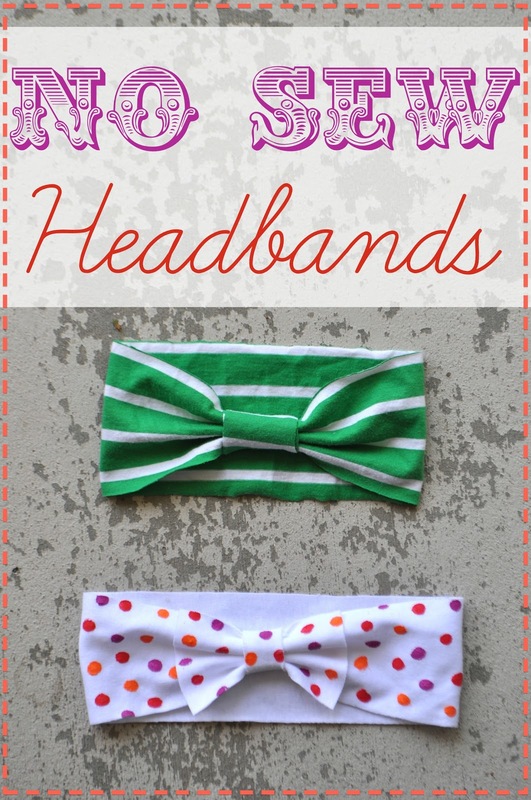 Make a headband by attaching the ends. Gather where the seam is and use the other rectangle to wrap around the headband. Use the tape at the end to secure it. That's it. I was serious about the two minutes. These are super comfortable for a baby, with no seams to even irritate them. Plus, knits are so soft and they don't fray. I plan on making a larger one for myself. For the second headband I did everything the same, except I added an additional rectangle of fabric on the headband to look like a bow. Then I decided to add some life to the knits by stamping them with fabric paint (same paint, but a new bottle). I used the top of an eraser and pounced it all over the headband to create polka dots. This way if it's a baby headband, there won't even be anything on the inside to irritate the skin. The paint is all on the outside. And there you have it. You can use up some scraps or t-shirts AND have a few new headbands in a few minutes. I love it! I have a lot of project for old tee shirts but never thought of this one! Thank you for sharing. So cute, I'm totally going to have to make me one today. I love headbands, they are definitely a staple in my wardrobe.